Thearon W. Henderson/Getty ImagesEric Reid and Colin Kaepernick kneeling in protest of systemic racism. Free agent safety Eric Reid believes his support of Colin Kaepernick’s protests are why he has not been signed yet. Reid knew this could happen and is ok with whatever impact the reaction to his protests have on his career. 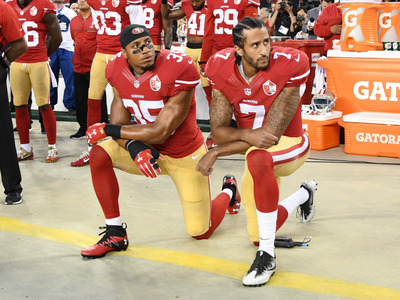 Reid joins Kaepernick as a notable example of a protester who hasn’t found a new NFL team. Former San Francisco 49ers safety Eric Reid, who knelt during the national anthem with former teammate Colin Kaepernick to protest systemic inequality and police brutality, has gone unsigned so far in free agency, and he believes his protests are the cause. In a follow-up tweet, Reid went on to make it clear who he believes that league owners are responsible for his current circumstances. Last December Reid had acknowledged that his protests could hurt his chances of finding a new NFL team, as reported by ESPN at the time. As Sports Illustrated noted, Reid was the first player to join in Kaepernick’s protests and has been a vocal in his support of the protests, even writing an op-ed in the New York Times explaining why they had decided to take a knee. Reid, a former Pro Bowl safety, has good reason to believe that his protests are why he remains unsigned, given that Kaepernick went unsigned all of last season despite easily being good enough to merit at least a backup quarterback spot on an NFL roster. Kaepernick has filed a grievance against the NFL accusing owners of conspiring to keep him out of the league and is still training to get another shot in the NFL.